When the words "motor home" come up, there are a few different images that flash into peoples' minds. Many of them are of older or simpler RVs that exist to help their owners camp in relative comfort. A luxury motor coach, of course, is an entirely different option altogether. Few individuals would be able to easily envision just how lavish and comfortable some of today's conversion coaches can be, nor the kind of engineering and design expertise that goes into making each of them impeccable recreational vehicles that don't sacrifice an ounce of drivability nor interior comforts. Instead, they meld the two necessities together to create sleek and beautiful constructions that can be tailored to their owners' specific needs. Have you purchased a luxury motor coach that costs more than $500,000? If so, you probably already know how important it is to make sure that your purchase is properly insured. Do you really know the best insurer out there and what you should look for in an insurance policy that covers your RV? It is important to make sure that you opt for an insurance provider that understands how to provide you the absolute best value for the money that you spend every month on your policy. When you are looking into finding the best insurance provider for your motor coach, there are a few things to keep in mind. Motor home insurance is different than other forms of auto insurance, for example, in that you must take different factors specific to your vehicle into account when reviewing policy options. 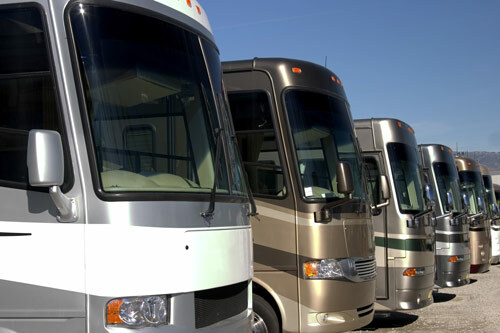 Your recreational vehicle insurance policy should reflect a variety of issues. The kind of RV that you drive as well as its cost are two of the major factors to keep in mind, however there are others that you must consider as well. The way in which your vehicle is used, how often it is used, where and how you store it, and the kind of personal property you keep in it are all questions that you must answer before you can find the best insurance policy for your needs. In addition to all of the above, do not forget that your own driving record as well as any previous insurance claims you have made in the past are other factors that can either increase or decrease the cost of your package. Finally, the company behind your conversion coach can have a significant impact upon the final insurance policy package that offers the right balance of protection and cost effectiveness for your needs. If you are looking for a quality manufacturer of luxury motor coaches, take a look at the list below. We've taken the time to find some of the best options in the industry for your consideration! Founded in 1924, Prevost is a leading manufacturer of luxury motor coaches and recreational vehicles. Originally known for his excellently crafted school furniture and church pews, Eugene Prevost was a cabinet maker who eventually expanded his attention to building custom REO truck chasses. At the time of its creation, the company was known as Les Ateliers Prevost, however its name would change along with its owners until, in 1995, it was sold to Volvo Bus Corporation. Throughout the history of the company, Prevost has steadily increased its number of employees as well as its building standards, adapting alongside society and its increasing love of smart technology to evolve into a manufacturing company with traditional roots married to modern flair. While the name of the business has changed, Prevost has always maintained and incredibly high level of quality and expertise in their luxury buses. Whether you are looking for excellent construction, smarter transportation and technology solutions, or both, Prevost offers some of the very best motor home and RV options available. This is true regardless of the exact purpose that the motor coach will fulfill, from luxury conversion coaches to carefully crafted touring vehicles. At Private Client Insurance, we can tell you from personal experience just how useful and sleek Prevost's high-end offerings are. We think that it is important to experience the concerns of our clients firsthand in order to best serve them. That's why we own and operate a Prevost Bus, and are proud to be intimately familiar with both the brand's impeccable construction as well as any potential needs our clients might possess. Millennium, an aviation, marine, and luxury coach manufacturer based in Central Florida, is well-known for its custom conversion coaches and RVs. Their manufacturing facility, located in Sanford, is over 100,000 square feet – and they use every inch of that to create some of the most well-made luxury motor homes on the market. The company was founded in 2001, a year known in the United States as the beginning of one of the worst recessions in recent history. Millennium thrived regardless of the decrease in spending that took place during that time, establishing itself as a triumphant manufacturer of luxury motor coaches that serve a wide variety of uses and have found fans among a diverse population. When the phrase "RV" comes up, many individuals immediately picture a cramped, awkward construction that struggles to find its place between "home" and "utility". Millennium's recreational vehicles do not have this problem. In fact, Millennium has worked hard to create custom motor coaches for celebrities and avid travelers alike, seeking to achieve a balance between easy drivability and a high-end interior that provides customers with an astonishingly luxurious experience. What's more is that Millennium has succeeded in striking that balance, and they've done so well. Some of their motor homes have been sold for over $2,000,000, a price tag that might surprise some, but should give a good indication regarding the quality that each of these vehicles retain. Liberty Coach is another name that has become synonymous with "luxury recreational vehicles". Founded almost 50 years ago in 1968, Liberty Coach is a company that has modest roots as a family-run, background business. It was truly a labor of love to everyone involved, and today the family still retains control over the company and ensures that every motor coach meets their exacting expectations before it is sent off to its new owners. Liberty is proud to manufacture Prevost conversion coaches, and their relation to Prevost alone might have been enough to hint at the quality creations that they offer customers. Of course, Liberty is not a company that needs to rely on another's name to gain recognition. They not only build exquisitely crafted RVs, but they also work hard to make each one a little more impressive – and perfectly suited to their client's specific needs – than the last. Making the decision to work with Liberty Coach means making a decision to opt for some of the very best work in the motor home industry. The company offers impeccable engineering as well as detailed craftsmanship designed to create a seamless recreational vehicle that looks just as great as it functions. Something else at which Liberty Coach excels is design. They spend much of their time ensuring that each and every RV they build is carefully created with both style and usability in mind. The result is a premium coach that melds superior construction with modern flair. Founded in 1983, Marathon Coach has been a major player in the luxury conversion coach industry for more than 30 years. The company has its roots in the conversion of commercial bus shells to lavish recreational vehicles, and the quality of their motor coaches has been impeccable since day one. In fact, Robert A. Schoellhorn was so enamored with his Marathon purchase in 1990 that he became the company's biggest proponent. The Schoellhorn family has owned Marathon since 1992, and it has grown to be one of the world's most experienced and largest luxury RV manufacturers. The past two decades in particular have been a time of unceasing growth for the company, thanks in large part to their ability to effortlessly mix modern technology with high style. Marathon is another manufacturer that really redefines the term "recreational vehicle". In the past, these constructions were often seen as rather niche options available for individuals who were willing to exist along the fine line between a hotel room and a tent while traveling. They were comfortable enough for a road trip, in other words, but didn't necessarily compare to a fully-fledged home. Marathon's conversion coaches are an entirely different breed. Their luxury vehicles truly live up to the descriptor, and owners of them can attest to the fact that there is little in the way of compromise in these vehicles – they are beautifully designed and packed with all of the amenities you might expect to make your life easier.